Selling an RTS on a console has always been tricky. Sure, we want the convenience of sitting on our couch to play our favorite strategy games, but it’s a hassle to cram a multitude of actions into the limited button space of a console controller. We are now on the eighth generation of consoles and the RTS still seems to be an elusive genre for the systems at play. Developer Petroglyph hopes it has found the solution to your RTS console woes in its latest release on PS4 and Xbox One. Enter 8 Bit Hordes. While not actually a brand new game, as it was actually released in 2016 on PC after their previous title 8 Bit Hordes, Petroglyph is looking to offer a simplified control scheme on its already popular title for console players. But did the Las Vegas based studio do the genre justice? Lets find out. We’re in a renaissance period where nostalgia runs rampant and anything with a pixel or retro style is sure to sell some numbers on its look alone. 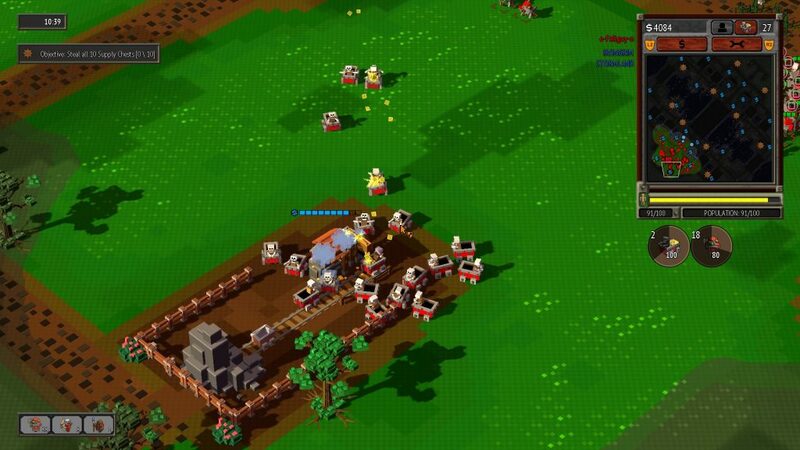 To begin 8 Bit Hordes not only tries to sell players on this with its name, but also its voxel based graphics and simpler take on the modern RTS game. “8 bit” does of course look and play better than something you would find on a Nintendo or master system and is much more in line with something you would see in Minecraft. Everything in the game is voxel based which gives it a chunky retro feel while giving it a bit of polarizing look where people either love it for the simple minecraft-esque aesthetic or hate it. No matter which camp you’re in the over-all game play is… Ok.
It’s a pretty standard affair where players are tasked with building up a base of operations to produce units and go on the hunt for their opponents and crush every last one of them. This model works very well as using the joystick felt responsive and accurate enough to give basic commands and most of the important actions were mapped appropriately on the controller. The main issue that I ran into within the first few missions started to show the games short comings pretty quickly. While everything feels pretty good in the first few missions of the campaign as they show you ropes, the difficulty instantly spikes up after that while you’re still trying to get the feel for the flow of the game. I went from comfortably guarding my base and sending units to do recon and taking out the opponent with some effort, to the next mission completely destroying me three times in a row until I found out that I actually gained access to arrow towers for defense. I’m not much of a “hold my hand” kind of gamer but it would have been nice if the game at least said “you now have arrow towers” and I would be more than happy to play with them and see what they can do. 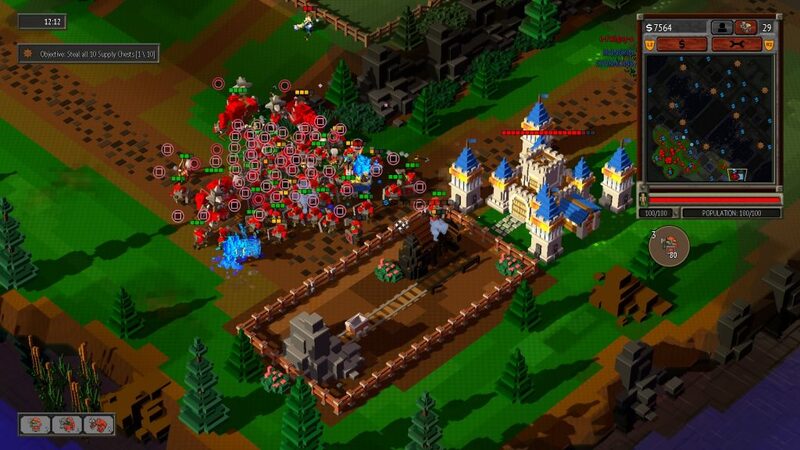 8 Bit Hordes is also limited because players are only able to build one building at a time, one unit at a time from a specific building and they have a ridiculous limit on where you can build your buildings. Players are only able to build within a certain range of their previous buildings which means if you want to spread to another section of the map, you need to build a series of farms or arrow towers just so you can build a another base at the next mine area. For a game that bases itself on map exploration and expansion, this seems like a serious design flaw. This was a bit of a running theme in the game as I came to some of the harder levels these choices felt like more of a burden and less of a game mechanic. As I stated earlier, the controls aren’t bad in this game. When I move the stick it’s accurate and moves the way you want it to. The buttons are pretty well mapped out and are responsive. The issue comes in to how the game is built to handle all of this in such a simplistic way. I constantly found myself getting frustrated with my units for having bad pathfinding and getting stuck on parts of the map or telling them to move to a point to attack and meanwhile they ignore the 30 archers raining death from above while they mindlessly wander to their destination. See, the game has a simplified way to control your armies that in theory should work quite well. When creating a unit you can select if you want to create the unit under square, triangle, or circle and you use the X button the execute commands. But when your army gets into a battle, you can only control those tagged units under their tag button so if a couple units are wandering off or acting completely useless, you have to call your entire tagged team to redirect them. This means if a couple team members are attacking a harmless miner and you need them back in the fight, you have to get their entire tagged team to acknowledge another attack or movement command which can really ruin the flow of your battle. As stated earlier, your AI can get confused in a large scale battle which makes them want to attack the last thing that damaged them, but when a group of archers surround you and fire, your entire team spins around in circles confusingly trying to attack all of them at once and I found myself having to gather the entire team and tell them to attack one archer at a time. 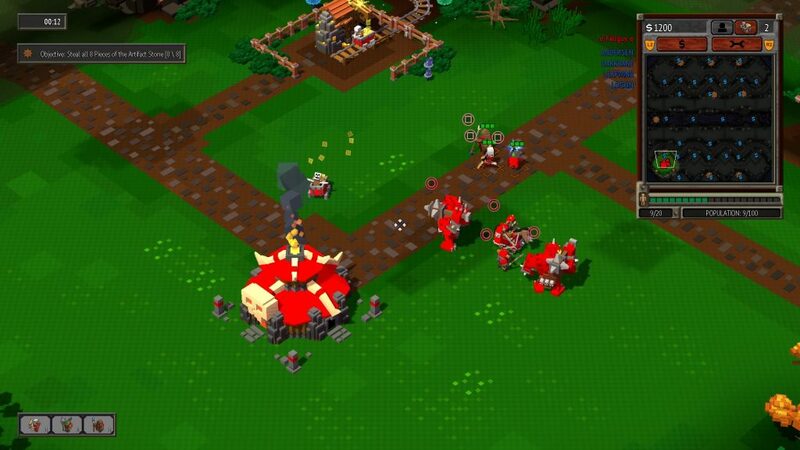 Unfortunately, this control style doesn’t only fail on the combat units, but it also fails on the miner units. The game has you collect gold from mines strewn about the map. A pretty basic concept that works in theory, but the miners are down right stupid. After the miners strip a mine of resources they will pathfind their way to the “closest” mine and continue on doing their job. Only problem being that it’s an absolute crap shoot of which mine they choose as I constantly found my miners under attack because they decided that the mine next door near the enemy base had better gold in it instead of the fresh mine that was literally 50 feet from my base behind the safety of my arrow towers. This is where the unit control is at its worst because’ unlike the tagged units, the miners are individuals and you have to click on each one separately and assign them to a mine. And if you have 30 mine carts running around, it is an arduous task to say the least. Honestly’ I feel like a lot of the control and gameplay could be saved though a mix of remapping and adding a few quality of life controls. Or at least let me retag certain units with a different button after they are created! Ok, so it’s not all bad here though. Even though I had a lot to say about the core mechanics of the game, I think there is still a good game underneath it all. The game ran very well without ever dipping frames and the soundtrack was fun and simple even if it did have awkward drop offs during gameplay. 8 Bit Hordes is actually quite huge when it comes to content and went way beyond the scope of anything I would normally expect of this type of title. The game includes a dual story campaign where you can either play as the humans or orcs with their own unique paths and quests. On top of that, each story mission includes a easy, medium, and difficult setting as well as offering rewards for meeting certain criteria during a mission, such as destroying all buildings or killing X amount of a unit under 5 minutes. For the people that love a challenge, there is A LOT to dig in to here. Even though I’m not much of a multiplayer person, they have a solid amount of content there too. There are actually other unlockable teams that can be used such as modern armies and future tech military. The online multiplayer goes one step further and even lets you play cross title with their previous title 8 Bit Armies which is really cool addition. Overall I feel that Petroglyph played it safe and made more of an homage to the classic days of RTS like Warcraft and Command & Conquer instead of trying to reinvent anything. The controls are solid and there are some good ideas in their, but overall its a bit cumbersome to play and there are some definite issues to overcome to enjoy the game. Some players may welcome the higher difficulty and different flow of the game, but I found it to be more of a stumbling point for me. So, if you can get past its rough edges and you want some down and dirty RTS action for your console, you can go check it out now on the PlayStation store. 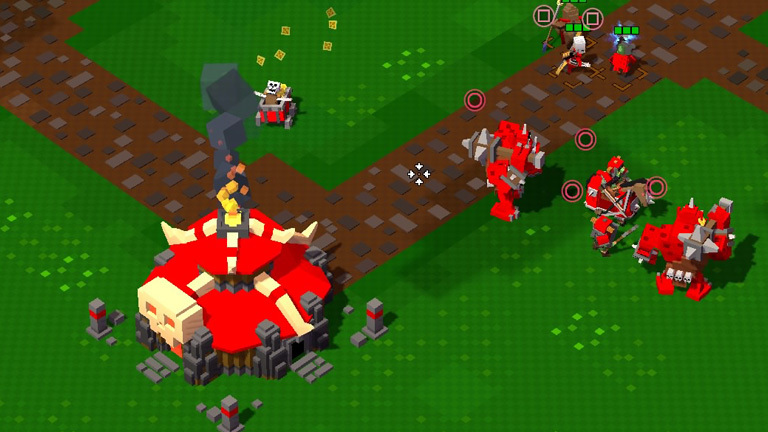 A voxel based console RTS that tries to simplify things for the platform but comes up short. There is a whole lotta game here but the simplistic controls and poor AI end up making the whole experience hard to enjoy unless you really love the RTS genre.